If you’re a bit anorakish [is that a word…ed?] then you can go round looking at roof tiles and trying to spot what happened in the evolution of buildings. 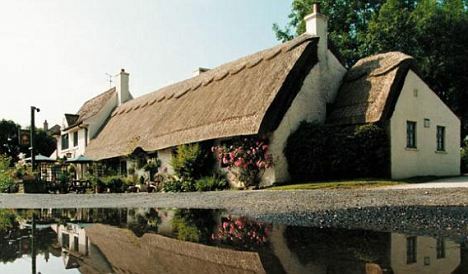 Many English [and Scottish] houses had thatch which, if correctly applied, was pretty good and generally watertight. There might be a bit of problem with fire and it generally provided quite a home for a growing menagerie of local wildlife – birds and those little grey furry things with long tails. In the 19th Century you could still find thatch on rural buildings but there are perhaps only around twenty left in the North Yorks Moors National Park, and a few more in surrounding areas. Some were replaced with corrugated iron, but the most appealing replacement was clay pantile. Originally arriving from Holland as ballast in ships, pantile trade rapidly increased and the reroofing spread along the east coast of England and Scotland but rarely reached further west than the Pennines. The roofs still had stone ridges and, on big roofs, a couple of rows of stone slate at the gutter level [eaves] to spread out the rain and stop it flowing over the gutters. Pantiles funnel water down the valleys. We wish we’d done that… Mind you, we did find bits of straw in the roofspace when we came to re-roof our [pantile] roof, a house that’s mostly cobble and probably around 350 years old. Most of the remaining thatched buildings are at the Ryedale Folk Museum at Hutton-le-Hole, where buildings have been acquired and moved into place from elsewhere in the Park, and Spout House [former Sun Inn] in Bilsdale, for example. Ryedale Folk Museum is a North Yorkshire version of Beamish but no tram. Combining excellent food and thatch [!] is the Star at Harome. We’ve been visiting the Star in its various ownerships since a memorable family 21st birthday party in late 1970 – an institution then – and we’ve seen some changes. It was good then, but fell into decline after being sold to “someone who’d always wanted to run a pub”. Run a pub into the ground it seems. In 1996 Andrew Pern took it over and the rest is history. Well, almost. So successful was the pub [and the shop, and the cottages and the deli…] that it was a bit of a surprise when it lost its coveted Michelin Star in 2011. Still, this year it claimed it back. It’s not all good news though. Whist the original building is rather magical and you used to take your coffee up in the roof, there’s a modern extension [no problem in principle] that somehow jars – a bit too metropolitan perhaps? Bit like the front bits of Rick Stein’s place in Padstow – glass, chrome, Italian tiles etc – more like Mayfair than a rural idyll.